Ziad Antar, Cote d’Azure Hotel, Jnah Beirut, Built in 1973, 2007. Courtesy of Selma Feriani Gallery, London. Born in Saida, Lebanon, in 1978, Ziad Antar studied at the American University in Beirut and the École Supérieure d’études Cinématographiques (ESEC) in Paris. His work in photography and video examines approaches to photography and what processes lie behind the production of images, not to mention their subsequent role as symbols of time passing, and the apparent realities of cities. Although not interested in the final quality of the image, Antar is singularly preoccupied with the exigencies and formal demands of image production and the everyday contexts out of which photographs emerge. What makes an image symbolic, he seems to ask; or, more simply, what makes an image?In this conversation with Anthony Downey, Antar explores the processes involved in producing photography with expired film – some of it damaged, some half-usable – whilst using an obsolete camera. Defying the technological advances of digital photography, Antar enages with ‘how images get eaten’, or come to pass into archival contexts or, indeed, are consumed over time. 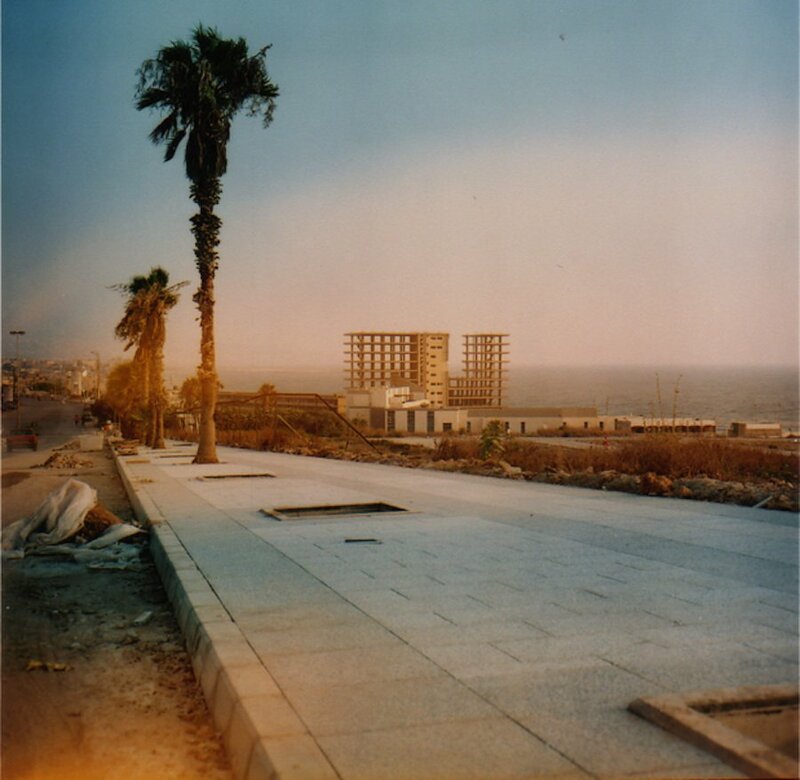 For Beirut Bereft (2009), he took the abandoned buildings of Beirut as his subject matter, the precariousness of his practice reflecting, in part, the precarious status of these buildings. 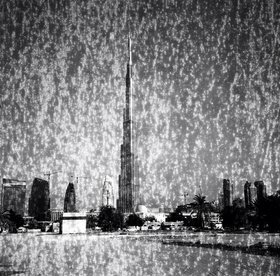 In his most recent project, Portrait of a Territory (2012), Antar turned his practice to the coastline of the UAE in an effort to depict its timeless outlines in the face of the unforgiving light – and, again, the vagaries of film stock and equipment – that reigns over the region, giving it both a feeling of visual homogeneity and yet a certain oneiric individualism. Anthony Downey: I want to talk about the series of works Expired (2011), which was first shown as part of The Mediterranean Approach and The Future of a Promise at the 54th Venice Biennale. These are photographs shot on ten rolls of black and white film that had an expiry date in 1976, and you used a 1948 Kodak Reflex camera to shoot these films with. Could you tell me about the process of taking these images, the technique behind it, and how this relates to the subject matter of the images? Ziad Antar, Hashem el-Madani, Sidon, 2000, from the Expired series, black and white silver print photograph, 50 x 50 cm, edition of 5. Courtesy of Selma Feriani Gallery, London. 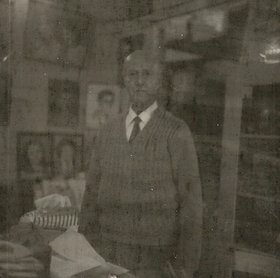 Ziad Antar: I managed to get the film from Studio Scheherazade, which is Hashem el-Madani’s studio in Sidon, Lebanon. The original film was made in 1973 by Negra, a very old company, and technically it expired in 1976. What expires is the living material when film becomes out of date, and when this expires, you cannot use it because it does not give you a sharp image, or it won’t give you a very good image. It is this issue that I explore in my work: What is a good image? Today when we try to develop the technology that surrounds taking an image, what we are trying to make is a good image, an image that translates the reality of what we see before us. But in my artistic practice, I do not care about translating the same image that I am seeing. That was my primary interest in trying to experiment with these films. When you have this documentary style of thinking, you always want good film to make good images, because that is what people want to see, that is what they expect. But with this expired film, you are never certain of what you are going to get in terms of quality when you expose it to light; indeed, you are not even sure there will be anything there to see. You also need a camera, when you use this film, which takes medium format images. What is important is there is a minimum of know-how involved in order to make these images, but you are never sure what will be there when you do. I should also note that Studio Scheherazade is related to the notion of an archive, which el-Madani and other curators and artists have worked on. When you go there you go to a place with a huge history that began in 1947 or 1948, depending on who you ask, when Hashem el-Madani shot images of the town of Sidon. When I took this film and started to make images, I wanted to somehow continue the work of the archive, but I also had this anti-archival urge, this feeling that I didn’t want the results to be expected or predetermined. And that is why I used this expired film, which is both from an archive as such and can be used to develop further a broader archive of images but with less of a documentary feel to it. AD: So, to a certain extent, the expired film is both ‘archival’ yet also lends itself to an aesthetic of the archive, a sense of agedness, but it also disrupts any certainty in the process of archiving. ZA: Yes, that is the aesthetic behind the process, or the process behind the aesthetic. But this aesthetic you cannot just see in one image, you must see several images in order to construct the aesthetics of expiration, how images get eaten. It’s not a motif that you can duplicate on Photoshop, because some images and some films expire differently than others, so there is always an element of chance. AD: There is also a very specific decision behind the choice of subject matter. There is a photograph of the Burj Khalifa, for example. Could you talk a little bit more about the subject matter and the choice of subject matter, and why you would take a photograph of what is the tallest and one of the most modern buildings in the world with an old camera and using expired film? ZA: I have always had an interest in taking images of derelict buildings. I produced a work that was shown in The Mediterranean Approach as part of the Venice Biennale last year that was called Beirut Bereft, alongside a book I made with curator and writer Rasha Salti. The process entailed shooting all the buildings in Beirut that are not functional, or had never been functional, even since they were built. In Beirut, these buildings date from the 1960s through to the 1990s. I always looked at these kinds of edifices, or buildings, as sculptures in the city. Each city has its own building, not as a cliché but it has an identity, and the Burj Khalifa has become symbolic of Dubai. When I shot photographs in other cities using expired film, like in New York or Cairo, I always took an uncomplicated point of view, especially in the choice of framing and the depth of the image – I never took close-ups, for example. Technically, you cannot shoot close-ups with these films, because you need a lot of light, which means you need to be stable. So I took general views. When I came to Dubai there was, on a political level, this change in the nomenclature of the building from Burj Dubai to Burj Khalifa, and for the opening they changed all the signs of Burj Dubai to Burj Khalifa. (The name was originally Burj Dubai, but it was bought by Abu Dhabi due to the financial crisis and it was renamed Burj Khalifa.) I didn’t really know how to capture this, but I saw that this country is not only a dream, this country is a real one that lives through successes and crises, and that things were getting real: Dubai was in crisis and Abu Dhabi had to bail it out. I saw that for the first time, the Emirates were getting more real because they had a problem, which is somehow good for the modern history of this country. It means there are changes to be dealt with and problems to be confronted. And the best buildings, the tallest buildings, have been changed. So I chose to photograph it because I had an interest in showing that if there are no problems there are no successes. I didn’t try to put it down or hide it, but photographing it with expired films tied in with my initial idea of trying to make an archive, to put it in the history of photography somehow. AD: Could you talk a little bit more about Beirut Bereft and how these images were chosen, what attracted you to Beirut and the architecture of Beirut in particular? 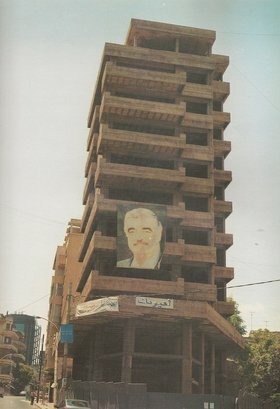 Ziad Antar, Building in Qantari, Built in 1970, 2007. Courtesy of Selma Feriani Gallery, London. ZA: It started with some notes made by Rasha Salti that compared her daily life in Beirut in the 1980s with her reminiscences of it when she returned after 20 years and saw again those same buildings, most of them long abandoned and opened to the elements. We came up with the idea that we should document all the buildings that are actually bereft, the ones that are unfinished, or those that were finished, functioned for a while, and then they stopped functioning. Most of the people who lived in Beirut during the 80s and 90s will have memories of some huge building that was never finished, just left as concrete, and we still live with them today. Some buildings were half destroyed due the Civil War (1975–1991) but others were never completed because of disputes and economics. But people have stopped seeing them, so to speak. When I went into certain neighbourhoods and asked the names of the derelict buildings there, the younger generation often didn’t know what they were. We seem to have erased them from our memory – some people pass near these buildings every day, and they do not know if they are empty or not, used or abandoned. So this was really interesting, especially because there is a huge quantity of these buildings. You can twist all these structures in your mind and imagine that you can change them into museums, perhaps, and then you will suddenly have around 80 museums in Beirut. But they are still there standing as sculptures. AD: Do you see them in the way that, for example, Bernd and Hilla Becher see their iconic water towers, in a sculptural sense, with a degree of objectivity, when you look at them and photograph them? ZA: I certainly photographed them as sculptures, but this was in a period when it was difficult to shoot buildings using a tripod due to security issues and each area had its own people patrolling areas looking out for any form of trouble, and a tripod was naturally going to attract attention. So, I couldn’t take the point of view that the Bechers’ take, for example, or a German photographer coming out of Düsseldorf, and go along putting up a tripod and taking an image in 30 minutes. You needed to take your image and walk. I suppose this is the difference: I do not wait; I do not capture small moments. I do not capture a fraction of a second, because a fraction of a second will be captured automatically, you know, this is not a decision, a decisive thing; Cartier-Bresson’s ‘le moment decisive’ does not really interest me. I think more about the subject matter itself and maybe more about the sociopolitical aspect of the whole, the image of a building in Beirut and what it means, but I do not care about what’s happening in that moment exactly. I take images of decades. I also cannot, technically, put a tripod up and take my time working on the composition. At the same time, I cannot do a true architectural image because I cannot take my time over it. So, for this reason, I am taking shots of architecture that are not really architectural shots, if that makes sense; they are rather a bastardization of the image. ZA: If you want to make a point about the architecture of Lebanon, you speak about Solidere, which is a bit of a problem in itself. Solidere is a region of downtown buildings, and private companies came and took the land there and then they built towers. That’s it for me, you know. Good or bad, I think we need to put it aside. I do not mean to be dismissive, but the true challenge lies outside of Solidere. The problem with talking about Solidere is that it’s already made: the towers and buildings exist. The problems in Lebanon, however, are all related, you feel that there is no law in terms of building regulations and planning, just as there seems to be no law with other things. So the image of this city, this chaotic city, is not only in reference to the architecture: this chaos exists in all the other fields. If we focus too much on Solidere we forget what is happening elsewhere and how these things are related. Solidere does not reflect the truth of the Lebanese scene, but who put the idea in our minds that Solidere should reflect this? It shouldn’t necessarily do this. There are many more alternatives on offer through which we can make changes. AD: In Beirut Bereft, there are some images of the Murr Tower and the Holiday Inn. One movement wants to keep these buildings, as a memory, as a physical museum of conflict, and another element wants to take them down. 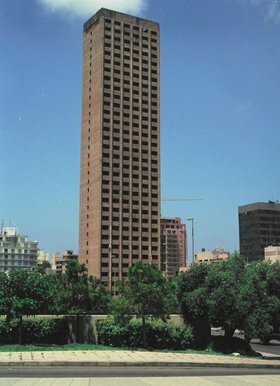 Do you have a view either way on, for example, the Murr Tower, which is still the most visible building in Beirut although it was first constructed in the 1970s? Ziad Antar, Murr Tower, Built in 1973, 2007. Courtesy of Selma Feriani Gallery, London. ZA: The problem here is that I don’t think there is a common territory for the two points of view to coexist: it is all or nothing for both. These buildings are standing as a result of indecisive people but, as I have already said, this lack of decision-making is in every single detail. As a foreigner, you have laws about such buildings – in France, if a building remains unfinished for a certain number of years, it becomes a squat that anyone can use. That’s the law. But this is not transferable to Lebanese society, because there is no common point of view or legislation to deal with these buildings. We can see these buildings as a sculpture or monument related to war but the government does not see it like this. It’s not like a socialist government, it’s more liberal and free-trade oriented, so the private sector directs its own affairs with little input from the public sector. So with each building you may ask, why was it not destroyed? Not because of a point of view related to arguments about preservation. They were there because the owners couldn’t afford to destroy them, and there is no law to sue them if they leave them like this, so they leave them. Before the most recent financial crisis, small parcels of land cost $3 million, and most of these buildings disappeared because it was financially viable to clear the land. If you have a building, you can destroy it and you can make another building – it makes financial sense. This approach does not make sense to those who want to preserve elements of this architecture. Some of these buildings belong to rich Christian Armenian families who come from Syria. They and others live abroad and they don’t care about what is happening in Lebanon, about public opinion. They have this building, they have money, there is no law, and they use the building for two parking stalls and that’s all they need to do to keep it. For this reason, I permit myself, or each artist can permit themselves, to act as owner of all these buildings and think ‘this is a museum’ and ‘this is a playground’ and ‘this is a parking lot’ – that remains a clear objective of mine and others’ work on these buildings. 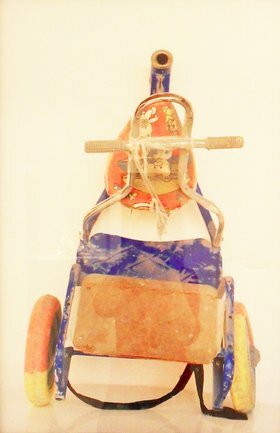 Ziad Antar, Tricycle, from the Products of war series, 2006, photograph / inkjet on photo paper, 73 x 50 cm, edition of 6. Courtesy of Selma Feriani Gallery, London. AD: I am going to shift the discussion slightly to a series of works that you produced in 2006 – in fact they were the first works I saw of yours, a series of C-prints called Products of War. We are moving away from a macro level of the ruins of war, so to speak, the monuments of war, to a very micro level here, inasmuch as you took photographs of very ordinary objects – a can of vegetarian spread left over by Israeli soldiers in the aftermath of the 2006 war, an emptied tin of tuna, a child’s bicycle, and other very ordinary objects made extraordinary by conflict. Could you talk a little bit about these images, how they came about, and of their importance to your thinking about photography in general? ZA: The series comprises nine images, of some food, some ordinary things found in the ruins, but when I started this series in 2006 I wanted to avoid the notion of the ‘found object’, because that context is too easy. For example, the wheels of a child’s bicycle – yes, they were found in a ruin, and that has its own implications. The thing that intrigued me was the tuna can. When you take an object out of its context, and take it to your studio, it gives you the freedom to produce a point of view, and that triggers your imagination more. Following their incursion in 2006, the Israeli soldiers did not leave these cans in the supermarket; they left them in the soil of Lebanon among the ruins. A soldier was eating tuna, then left. I wanted to document this fact with less emphasis upon the obvious context, if that is possible. I wanted you to face the object and think: this is a vegetarian spread because some soldiers are vegetarian; they are human in the end. They come, they might die, they might not, but some of them are vegetarian. I was conscious that I also regularly eat tuna. This parallel can, I think, create a point of view that says more about the human element of conflict, the comparisons, the crossovers. AD: It’s as if you are de-contextualizing the object in order to reconsider a more human element, the day-to-day, the banal, the mundane. ZA: That’s why I chose to put them in the studio, to bring back everything home and shoot it on a white background and see what happens in a different context that is away from the place where I originally found these objects. When you get close to death and conflict, everything becomes the same. True, they are banal but they speak about what actually happened. I am not the kind of photographer that goes and follows the bombs and photographs people dying or a building that is being destroyed, I do not work like this, nor do I work for agencies – I prefer to reflect. And usually when there is a war, especially a devastating war, I prefer to put the camera aside during that time – there are more important things to do, especially in Sidon, and I build projects like Products of War little by little and over longer periods. The first images I took were of the tuna cans and in the end they became small sculptures. I like to reflect on the photography itself: are these documents of sculptures and what is the role of an image of these sculptures? I shot them and I presented them, in a normal, small format, so that they become documents and in that process we reflect upon what this process does to the original image and its former contexts. AD: Two things have come out of this conversation. Firstly, in choosing these objects you seem to get a sense of distance from the event itself, and again we could talk about how photography creates distance, but there is also a sense that rather than being interested in the big event, the spectacle, there is an interest in the everyday, the mundane, banal effects of war upon how people live their lives during a time of conflict. I would like to talk briefly about your video Safe Sound (2006). There is obviously a huge event going on during the filming of this short video – the Israeli incursion of 2006 – and yet people have to live through that moment as best they can, through the boredom and the ennui. ZA: I shot Safe Sound in the first days of the war, and it is a seven-minute film comprised of seven sequences in which I was capturing sound. The essence of my work is that I try to create something with the minimum. It’s more challenging that way, more interesting, and it gives you an opportunity to enquire into the medium itself. Safe Sound is an example of this, because outside you have one of the biggest wars in ten years going on, and you have a camera, maybe do not even have electricity but you must create. In this situation, you can create a small film with just the bare minimum. I decided to film the banal things and I was going to use an anti-television route to record events. I am not against television, at that time television was sending important messages. But I did not want to speak about this; I wanted to speak about myself living on a daily basis through this time. AD: The film moves us away from the spectacle we usually associate with television news, which is almost too easy to consume because it anaesthetizes us from what is actually happening, creates a distance that depersonalizes events. ZA: Yes, I would agree with that. 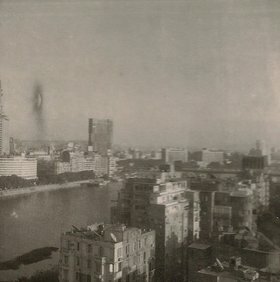 Ziad Antar, Cairo, from the Expired series, 2005, black and white silver print photograph, 125 x 125 cm, edition of 3. Courtesy of Selma Feriani Gallery, London. AD: I would like to return to the early images from Expired, because one of the things that has come out of this discussion is a sense of improvization. As you put it, how can you create with the minimum? I would like to go back to the very start of our conversation, where you discussed the actual film and the camera that was used. I might be wrong here, but there are two specific dates which I find quite interesting. You use a 1948 Kodak Reflex II and 1948 is the year of the Israeli declaration of independence, but also the year of the Nakba, and 1976, the date of the film’s expiry, is more or less the beginning of the Lebanese Civil War. Was that intentional, or was it just coincidence? ZA: No, it was chance. But these kinds of dates, especially in the Arab world, can always be weighted. For example, the films were bought in 1973. If you want to reflect on this date, it’s a big date, it’s the year of the Yom Kippur War. But I don’t think Hashem el-Madani was thinking about this when he bought the films. They expired in 1976, and they were badly stored. AD: Do we know why they were badly stored? ZA: Between 1976 and 2000, when I acquired these films, there was a lot of conflict as a result of both the Civil War and subsequent invasions, and water flooded his studio in 1982. There was also a fire in his studio at some point. These events meant that they were badly preserved and badly stored. I tried to escape telling this story, because it gives more meaning to this whole series, more than archive and anti-archive, more than experimentation. If I tell you the whole story of what happened to the film, it will be very political. And if, for example, I tell you why water entered – because an Israeli anti-missile hit the building and it was hosed down – we enter into the whole history of the region, and I don’t want to relate my images solely to those events, or to make accusations. My approach is beyond these events, I hope. Of course, my point of view is political – whenever you point a camera and you take an image, you have a frame, you have a point of view, a political point of view. But I don’t want to relate Expired to these events. They were badly stored, because Madani was in southern Lebanon and the entire area was under attack – you can imagine what happened. But it all ties back into this idea of creating with the minimum. I usually use a pinhole camera, it has no battery, it has nothing, just an open and shut function. You put the film in the back, the aperture opens, you capture an image, and then it closes. It is the easiest device on earth, the Kodak Reflex II, it has nothing. Just push, aperture opens, and you get some light. If you have the knowledge of how much time to open the aperture, you have an image. And that’s it. All the other elements come after that event. AD: I should say that I do not want to over-politicize your work because I think the aesthetic of your work speaks to a sociopolitical moment, some of it is based upon need, some of it on the demands of the moment, as in Safe Sound. But it seems as if the expired film, during those years, has indirectly taken on the imprint of history. And that has happened before you decided to use this film, which has that history in it, to look at modern contemporary history. ZA: When you take these virgin, un-exposed films, you take them from a store with all its history since 1948; that is true. When I took the films and used them, it was chance that everything came back in the final image. So what I am saying is that you cannot escape the political situation or all these stories of conflicts, but I try to escape them, or create my own point of view, through forms of experimentation but history will come back, indirectly or otherwise. AD: It is as if you try to avoid the overt politics through experiment – through engaging with chance – because politics is ever-present. We do not have to focus on the politics – it is there, it will always be there, and a way of avoiding that is by creating a different take on it. So, for example, in the products of war, by not focusing on the war, but by focusing on something incidental, one avoids playing in to the war and playing into the politics surrounding that. ZA: True, and then we have a more interesting margin to think in, which is: what is the art you are doing, what is the medium you are using, and why? This is much more interesting to me. AD: So you can focus more on the medium and what precisely photography is doing in this moment of interjecting into history, into the contemporary, into the present. It is more about the inherent politics of the medium itself and what the medium does to history and to the contemporary. ZA: You always ask yourself what is photography, what is this medium and there is never an answer to this. It’s going in the direction of asking how to represent, and what to represent, and these questions are all related to the death of the medium. I think, today, photography is asking more questions about the medium in relation to digital things, because something is dying in this whole medium. I’m not saying that photography is, but something in the medium is, we are losing it, and there are all these changes happening on a very technical and aesthetic level. AD: Finally, what projects are you currently working on? Ziad Antar, Foujaira, from the series Portrait of a Territory, 2010, C-print. Commissioned and produced by Sharjah Art Foundation, Sharjah. Courtesy of the artist. ZA: I am finishing my book on the UAE coastline. The book is titled Portrait of a Territory, and I have documented the whole of the UAE, from Saudi Arabia, Qatar, and the border of Abu Dhabi to Ajman and on to Sharjah, effectively covering the whole coastline. I used two relatively ordinary cameras, a Rolleiflex, for depth of field, and a Holga, which tends to give very imprecise contours and a kind of black vignette or border around the subjects depicted. I used Kodachrome film, which they ceased to produce in 2009. Unlike the images we spoke of earlier, there is less chance involved here but the sense of expiration or archival nostalgia is still there. The images I took are always facing towards the sea, or documenting what is around the sea. The reason I am doing this on a photographic level is that I am interested by the light in these countries, where you cannot take images whenever you want. The sense of restraint or the guiding principle here is therefore to do with light – or too much light. There are always certain restrictions to do with light in these images and it is very difficult to shoot images, as I do, in the midday sun; it is even difficult in the early morning or the late afternoon when the light is supposed to be good. But I nevertheless took images during the day with this hard light, and documented the coastline because historically, politically, and geographically, this coastline has a long history and this continues to interest me on a lot of levels. 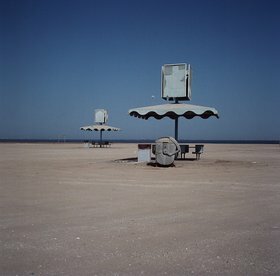 Ziad Antar was born in 1978, in Saida, Lebanon and lives between Saida and Paris. He studied Agricultural Engineering at the American University of Beirut before studying for a diploma at the École supérieure d’études cinématographiques in Paris in 2003. He has exhibited works at the Beirut Art Centre in Beirut in Beirut and in exhibitions including The Generational: Younger Than Jesus at the New Museum of Contemporary Art in New York and Prospectif Cinéma at the Centre Georges Pompidou in Paris. Antar will undertake a residency at The Delfina Foundation, London in spring 2012. Ziad Antar’s work is part of the Kamel Lazaar Foundation Collection. Antar, Ziad. “An Aesthetics of Expiration: Ziad Antar in Conversation with Anthony Downey.” Interview by Anthony Downey. Ibraaz. Ibraaz, 2 May 2012.